ms13 is a file locking malware that stems from the notorious Dharma family, which is currently one of the active strings in the wild. Ransomware-type viruses are used for extortion – mostly monetary. Once, inside, ms13 ransomware looks for documents, databases, pictures, etc. and then uses AES or DES encryption algorithm to lock data. Victims can quickly see that their files are compromised, as the name is modified in the following way: [filename]. [file extension].id-[unique identifier].[ms_13@aol.com].ms13. After this process, malware drops a ransom note FILES ENCRYPTED.txt, as well as a pop-up window that explains the situation in greater detail. Allegedly, users are meant to contact hackers via ms_13@aol.com or ms_13@foxmail.com emails and pay ransom in Bitcoins for the decryptor. However, users are not encouraged to do that and rather focus on ms13 ransomware removal. ms13 ransomware can slip into the system when users are downloading unsafe files from the internet (cracks, keygens, pirated installers), get tricked by fake updates, open malicious attachments inside spam emails, do not adequately protect their accounts, do not update their operating system, etc. To avoid such severe infections like .ms13 virus, refer to the second part of this article. After the initial infection, ms13 ransomware modifies a variety of system files. 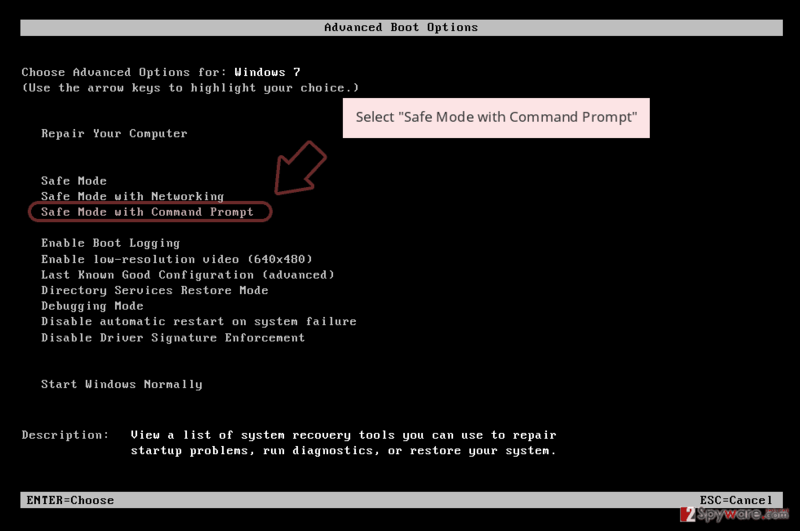 For example, Shadow Volume Copies are deleted in order to complicate the file recovery, or Windows registry is adjusted to launch the virus with every system boot and increase persistence. Some malware might also add an exclusion in the Firewall of anti-malware software, preventing its termination. Additionally, ms13 ransomware shows a pop-up window which explains to users how to proceed next. Bad actors offer test decryption, suggesting to upload one file, no larger than 1MB. This process has become pretty standard among ransomware authors, as they want victims to believe that the decryption is guaranteed once the payment is made. However, users might get scammed, and end up not only losing access to files permanently but also the paid money. Therefore, experts advise staying away from cybercriminals, and rather remove ms13 ransomware as soon as possible. 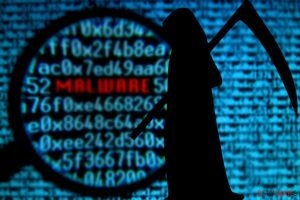 For that, victims should employ reputable anti-malware software that can detect and terminate the threat. We suggest using Reimage or Malwarebytes MalwarebytesCombo Cleaner. It is true that the ms13 virus cannot be decrypted currently. However, users can always save locked data and wait for the decryptor to be created by security researchers. Additionally, third-party recovery software might be useful – we provide the download links and instructions in the recovery section below. Unfortunately, but many users tend to neglect adequate security measures when it comes to protecting their devices from malware. This group of regular users is often joined by not only small businesses but also by leading organizations. For example, the “Big Game Hunting” was employed by another widespread ransomware family – GandCrab. Use strong passwords and two-factor authentication for all your accounts. ms13 virus belongs to Dharma ransomware family, and security vendors are long familiar with this type of malware. Therefore, there aplenty of tools that are capable of recognizing the threat under such names as TR/Dropper.Gen, Trojan.Encoder.3953, Ransom.Crysis.Generic, Trojan/Win32.Crysis.R213980, GenericRXEA-WW!D613CD49FA1D, etc. 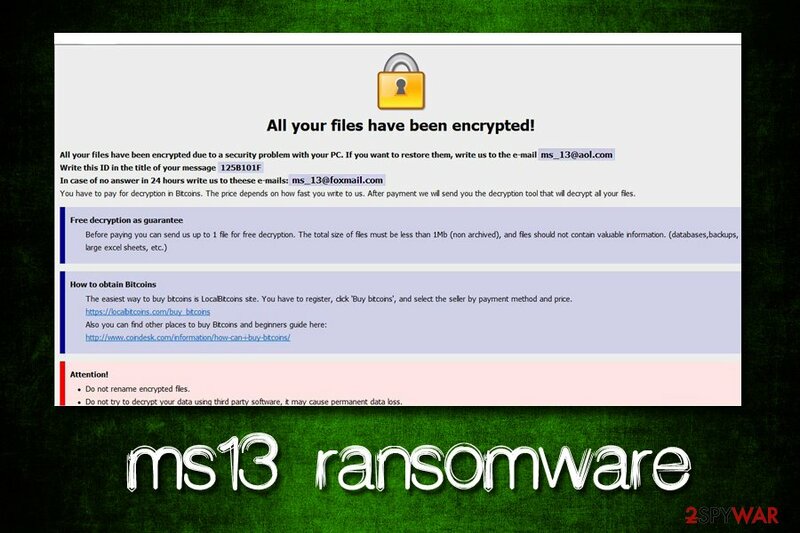 Therefore, to remove ms13 ransomware, download and install one of the security tools that can detect the threat and perform a full system scan. 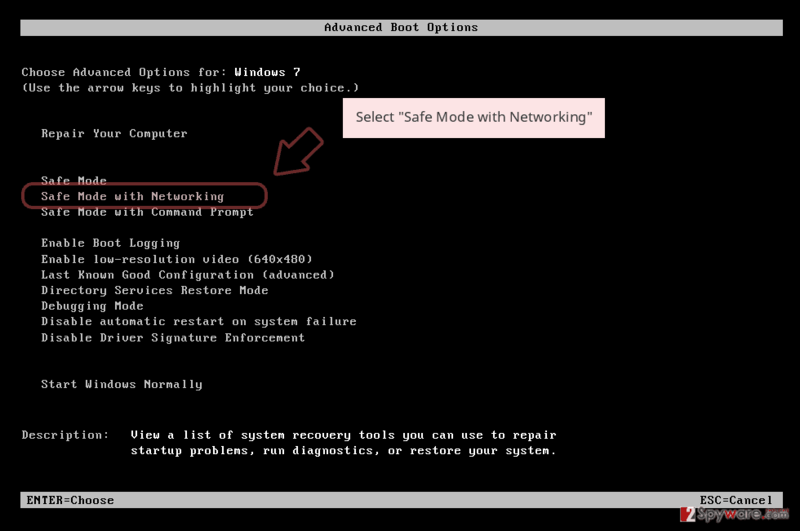 Be aware that the virus might prevent AV engine from doing its job. 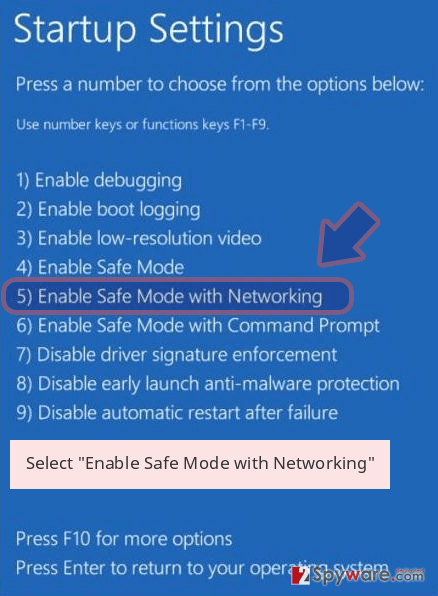 In such a case, enter Safe Mode with Networking and perform a scan from there. Once you complete ms13 ransomware removal, you can then proceed with file recovery. The safest way to retrieve data is by using backups. However, if you have none, make use of alternative solutions we provide below. Log in to your infected account and start the browser. Download Reimage or other legitimate anti-spyware program. Update it before a full system scan and remove malicious files that belong to your ransomware and complete ms13 removal. 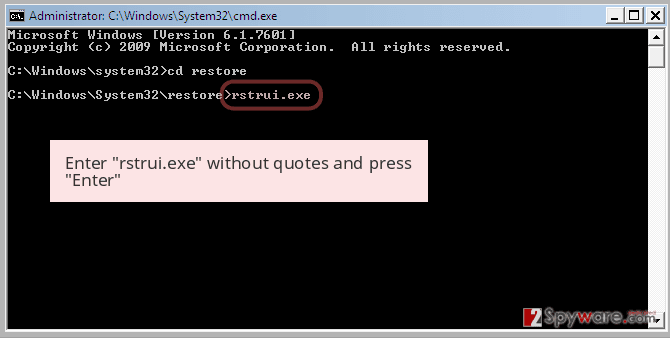 When a new window shows up, click Next and select your restore point that is prior the infiltration of ms13. After doing that, click Next. 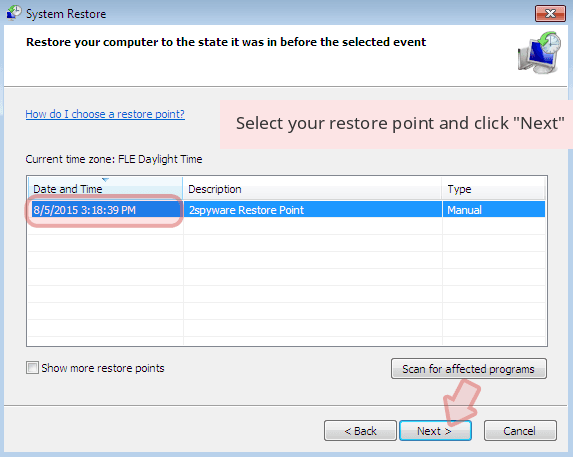 Once you restore your system to a previous date, download and scan your computer with Reimage and make sure that ms13 removal is performed successfully. 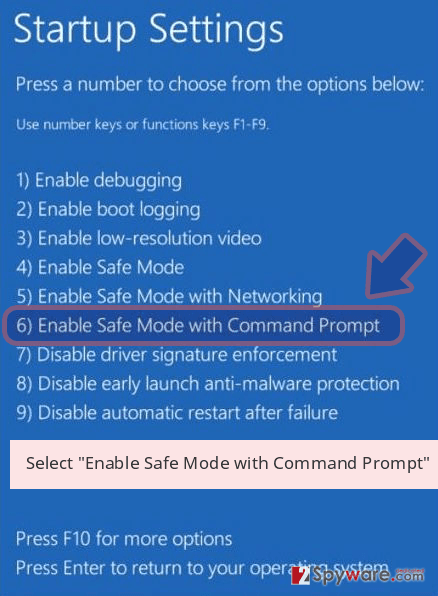 Guide which is presented above is supposed to help you remove ms13 from your computer. To recover your encrypted files, we recommend using a detailed guide prepared by 2-spyware.com security experts. If your files are encrypted with .ms13 extension, Data Recovery Pro might be able to help you recover at least some of them. 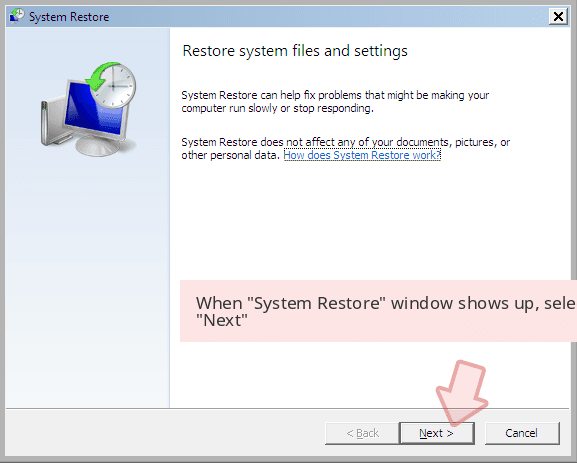 This method can only be used if you had System Restore enabled before ransomware struck. In case ransomware failed to delete Shadow Volume Copies, ShadowExplorer might be able to recover all your files. ^ Dangers of using pirated software. Bitdefender. Security blog. ^ Udenvirus. Udenvirus. Cybersecurity researchers. This entry was posted on 2019-04-08 at 03:58 and is filed under Ransomware, Viruses. You can quickly scan the QR code with your mobile device and have ms13 ransomware manual removal instructions right in your pocket. How did you remove ms13 virus?